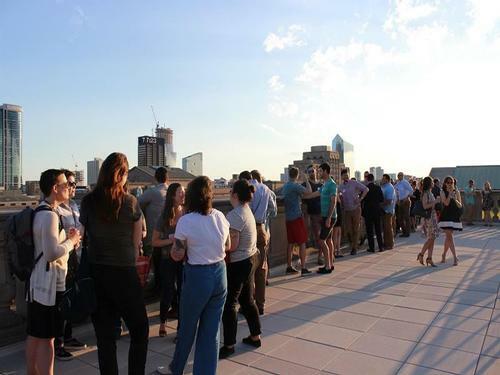 The Free Library’s popular rooftop beer garden series, Brews & Views, held in conjunction with Brûlée Catering, is headed back to the Parkway Central Library for a four-day run in October. On October 23, 24, and 25 from 5:00 p.m. to 9:00 p.m., and October 26 from 5:00 p.m. to 10:00 p.m., join us on the Skyline Terrace for refreshing drinks and spectacular views of the city! The October 26 date will coincide with the grand finale of Parkway 100, the year-long centennial celebration of the Benjamin Franklin Parkway organized by the Parkway Council Foundation. Institutions along the Parkway will celebrate on that day with festive offerings, and beer garden attendees will find additional activities popping up in Parkway Central, which will remain open through 10:00 p.m., including performances by BalletX and Philadelphia Argentine Tango School in the Grand Lobby. Attendees will also have a last opportunity to view the Free Library’s Corridor of Culture: 100 Years of the Benjamin Franklin Parkway exhibition in the West Gallery and check out the new exhibition Philadelphia: The Changing City on view in the Rare Book Department through 9:00 p.m. The beer garden is free to enter and no advance registration is required. All are welcome; guests must be 21 and up to purchase and consume alcohol. Staff will check IDs before allowing guests up to the rooftop. Local craft beers, wine, and cocktails will be available for purchase, along with a menu of made-to-order snacks from Brûlée's chefs. There will also be entertainment to energize the crowd. In addition, the street team from radio sponsor 96.5 TDY will be on-site. Listeners should tune to 96.5 TDY for details! For more information on the beer garden series, look for the Brews & Views event page on Facebook and follow @freelibrary and @Brulee_Catering on Twitter and Instagram! Cheers! Join us for the Fall 2018 installment of Brews & Views! 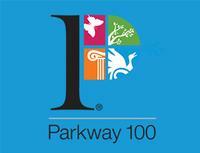 Catch the "Corridor of Culture: 100 Years of the Benjamin Franklin Parkway" exhibition before it ends on October 26! Add a Comment to The Free Library’s Rooftop Beer Gardens Are Back!